It is one of the greatest aviation undertakings of our time: a 26,000-mile perilous journey to circle the globe in a plane that doesnt use a single drop of fuel. The launch of the Solar Impulse II in March 2015 is the culmination of a 13-year bold endeavor to push the boundaries of human flight and demonstrate the potential for renewable energy. In the new documentary, THE IMPOSSIBLE FLIGHT, NOVA, a production of WGBH Boston, embarks on an ambitious quest with two intrepid pilots and a team of brilliant engineers, meteorologists, and flight controllers as they design, construct, and fly around the world the first zero-fuel, solar-powered airplane. In case you missed it, we have included it here below. Bertrand Piccard, joined by André Borschberg, a former fighter pilot in the Swiss Air Force and engineer with a graduate degree in management from MIT. 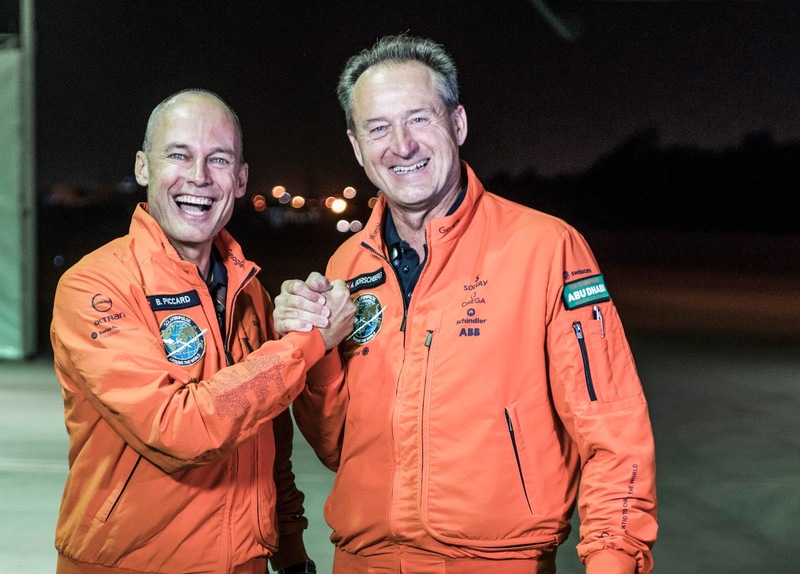 With the help of a diverse team of leading experts in aerospace engineering, meteorology, and flight control, these two daring adventurers create and fly an extraordinary and unique aircraft. In order to construct the plane, which many experts considered impossible, the team had to employ a number of groundbreaking technologies including ultrathin solar cells, high-capacity batteries, and massive but light carbon-fiber wings. 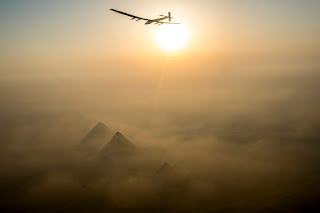 The Impossible Flight follows Bertrand and Andrés quest as they tackle seemingly insurmountable challenges, both technical and personal, in their mission to build and fly the solar-powered plane around the world. The first dilemma is how to build an aircraft big enough to collect maximum sunlight, but lightweight enough to run on as little energy as possible. NOVA reveals the multi-year design and testing process required to come up with a plane light, efficient, and powerful enough to make the voyage. The result is an aircraft with a revolutionary design, powered by 17,000 solar cells, each as thin as a human hair, which collect and transform the suns rays into electricity, to be distributed to batteries for storage and to four 17-horsepower engines. The planes structure is lighter than many gliders with a wingspan equivalent to that of a 747. The aircrafts skeletal structure is largely hollow, similar to the bones of a bird, and created from carbon fiber three times lighter than paper in a unique honeycomb sandwich design. The four, lithium ion polymer battery packs, able to store enough spare energy to power the aircraft through the night, weigh nearly 1,500 poundsapproximately 25% of the planes total weight. After years of the development and construction of the plane, NOVA cameras capture the emotional moment of takeoff. The plane departs from Abu Dhabi in the United Arab Emirates on March 9, 2015, heading from there to India, Myanmar, and China, facing multiple unwelcome delays as weather closes in along the way. Then, André faces the greatest challenge, taking the controls for 5 long days and nights over the Pacific Ocean to land triumphantlyand to everyones reliefin Hawaii. From there, Bertrand flies to the continental U.S., greeted by the sight of San Franciscos Golden Gate Bridge. Each leg of the journey presents its own challenges and discomforts. In the unpressurized cockpit, with no heat or cooling, temperatures inside range from -40°F at the highest altitudes to 104°F when they descend over parched deserts. Bertrand, heir to a family legacy of exploration, had previously set a record by flying a balloon around the world. But this challenge is more difficult as he has less experience as a pilot and Solar Impulse II proves a difficult plane to control. Bertrand requires additional training mid-journey when he runs into trouble on a flight. There are frequent conflicts with Mission Control in Monacothe team of engineers, meteorologists, and flight controllers who consider both Bertrand and André too ready to take risks. And weather is always a looming hazard; rain, humidity, crosswinds, and even sun-blocking clouds could easily doom the mission, while a sudden downdraft or updraft could break the aircraft apart. Everyonepilots and the team at Mission Controlare prepared for the worst to happen, including aircraft failure and bailing out over the ocean, if necessary. The flight around the world takes more than a year, with costly and disheartening delays for weather and repairs needed along the way. Finally, and triumphantly, Bertrand lands the plane back in Abu Dhabi where the journey began, a testament to technological ingenuity and perseverance. But ultimately the goal of the project was to deliver a message as the world faces the perils of climate change: If renewable energy can work on a fragile plane in the air, it can surely work on land. The Impossible Flight is a NOVA production by Far West Film Co. for WGBH Boston. Produced and directed by Noel Dockstader and Quinn Kanaly. Executive Producer is Chris Schmidt. Senior Executive Producer for NOVA is Paula S. Apsell. National corporate funding for NOVA is provided by Draper. Major funding for NOVA is provided by The David H. Koch Fund for Science, the Corporation for Public Broadcasting and public television viewers.